Rapunzel and Anna comparison. Frozen - Uma Aventura Congelante. HD Wallpaper and background images in the disney princesas club tagged: frozen tangled anna rapunzel disney. I wouldn't judge before we have seen Ana in movement....but so far, they don't look more similar to each other than all the princesses following the house style, like Ariel and Belle. Can we just stop and watch the movie first? I agree, we haven't seen any trailers yet. Besides, CGI animated character have many things in common, design-wise. I agree with Swanpride. By the way, does anyone know which country she'll from? You know what when I first saw something like this I was like, nothing I see nothing compared to them. I can't wait to see this movie! 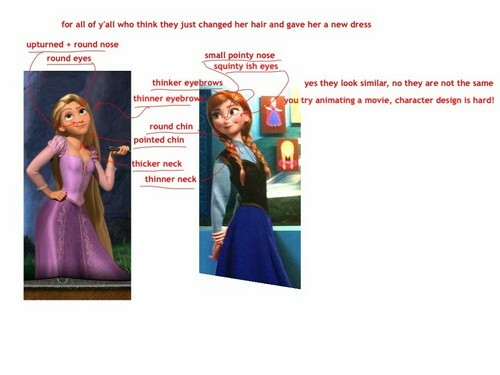 Also, Rapunzel has a pointy face, while Anna has a round face.